Kim Jong-Nam was dead within 20 minutes of being attacked and would have suffered a "very painful death" as his major organs shut down, Malaysia's health minister said Sunday. 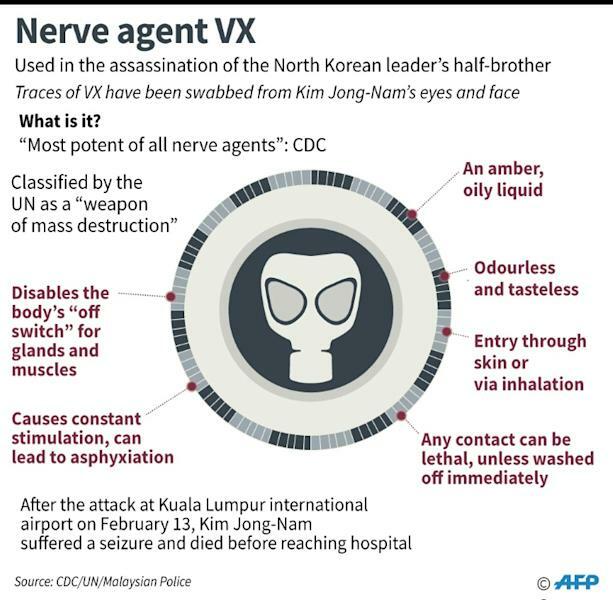 The estranged half-brother of the North Korean leader was killed with lethal nerve agent VX, police have revealed, after he was ambushed at Kuala Lumpur airport on February 13. Two women can be seen shoving something into Kim's face in leaked CCTV footage of the brazen assassination before he seeks help. "He died in the ambulance. He fainted in the clinic," Health Minister S. Subramaniam told reporters. "From the time of the onset (of the attack) he died within 15 to 20 minutes." Autopsy results suggested the 45-year-old died from "very serious paralysis" due to a lethal nerve agent, Subramaniam said earlier Sunday. Police are holding two women suspected of staging the attack as well as a North Korean man. They want to speak to seven other North Koreans including a senior embassy official, but four of the suspects fled Malaysia on the day of the murder. VX is so deadly it is listed by the UN as a weapon of mass destruction and overnight the scene of the killing in the budget terminal of Kuala Lumpur International Airport was swept by civil defence personnel in hazmat suits before being declared safe. "The absorption level was so rapid that within a few minutes the guy had symptoms." "The muscle goes into a state of permanent contraction," Subramaniam said, adding the dose was "so high" in this case the heart and lungs would have been rapidly affected. Police had cordoned off parts of the airport after authorities pledged to check all locations the female suspects were known to have visited. But the delay puzzled some travellers. Student Hariz Syafiq, 21, who was due to take a domestic flight later, told AFP: "Yes, I'm worried a bit. Why didn't they quarantine the airport? Both women suspected of carrying out the attack insisted they thought they were taking part in a prank video, although Malaysian police have said they knew what they were doing. One of the two female suspects in custody, 25-year-old Indonesian Siti Aisyah, reportedly told a senior diplomat Saturday she had been paid just 400 ringgit ($90) for her role, adding she believed she was handling a liquid like "baby oil". 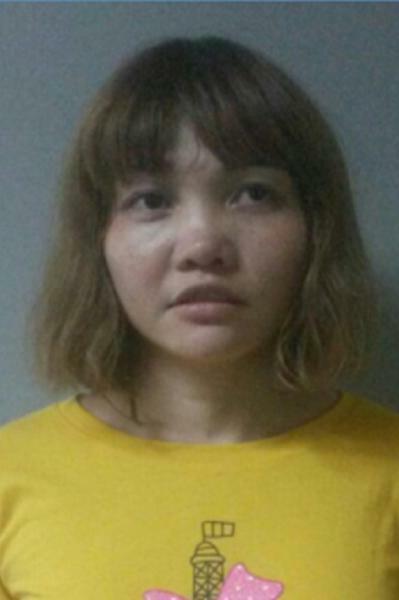 The other woman, Vietnamese Doan Thi Huong, 28, told Hanoi officials she had been tricked into killing Kim and thought she was taking part in a prank for a comedy video. Indonesia's deputy ambassador to Malaysia Andreano Erwin, who was granted consular access to Siti Saturday, reportedly said she did not know Huong. Police have said one of the women arrested after the attack fell ill in custody, adding she had been vomiting. However, Erwin said Siti was physically healthy while Vietnamese officials said Huong was "in stable health". Selangor state police chief Abdul Samah Mat told reporters an investigation was continuing at an apartment complex in Kuala Lumpur in connection with the four North Koreans who fled Malaysia on the day of the killing. He added that samples from the address had been sent for chemical analysis. One man wanted for questioning and believed still in Malaysia is senior North Korean embassy official Hyon Kwang Song, who enjoys diplomatic immunity. The news Friday that lethal VX nerve agent was used in the attack sparked anger in Malaysia and brought condemnation from South Korea, which has pointed the finger at the North over Kim's death. 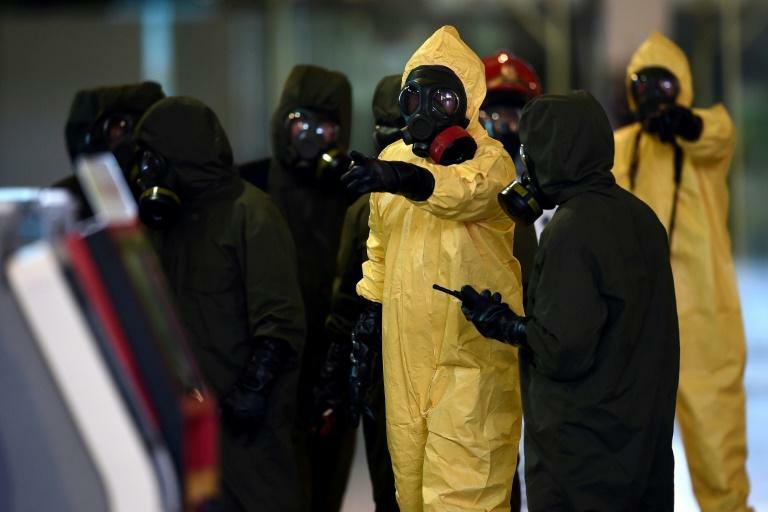 Seoul slammed the use of the toxin as a "blatant violation of the Chemical Weapons Convention and other international norms". No next-of-kin have yet come forward to formally identify the body or provide a DNA sample, but authorities have said relatives would be given more time to do so.